Performing this Saturday as part of the open source acid night at Ginlick in Shepards Bush – more info . Going for an all hardware setup as a bit of a tester for Kendal Calling. Setup is Â – Korg Electribe SX, Roland 707 Drum Machine, Roland Sh-101 Synth and newly acquired Boss Dr.Groove DR-202. 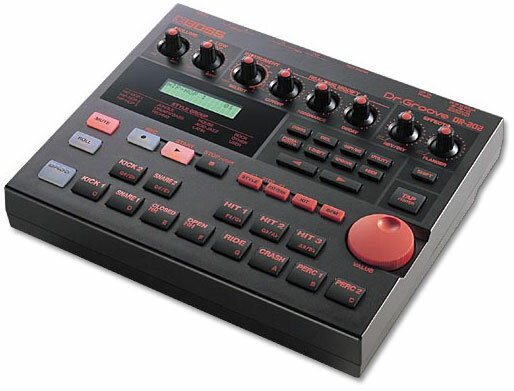 The Electribe has the master clock, with the 707 and 202 as slaves. The 707 sends sync pulses to the 101’s clock for arpeggiator and sequencer. Audio wise I have everything going to a small Yamaha mixer and an fx send to a Boss RF-1 effects unit. The RF-1 is running a hall reverb, bit crusher and some BPM effects that are quite mental. This setup is amazingly flexible with room for improvisation and live tweaking. Â I actually much prefer moving from each machine to tweak and adjust rather than flipping menus in a midi controller. Â The style I am doing is simple electro/ techno but it gets quite nasty and wig out at times, even with one pattern going. The 707 cuts through everything like a champion, and although a very simple machine has a great sound and is fantastic for live setups. I was unsure of the DR-202, but the sounds are great, with some lovely lo-fi scratches and hits, also the roll function is incredible allowing you to change the speed of rolls mid roll. Will post an mp3 when i done my set. Quip – The Up There Jar OUT NOW !